Cattle get pinkeye too! Most years this is not a problem but just like when people travel… we occasionally catch an illness. That is exactly what happened to our 25 head of cattle. This year was the first time we rented the pasture up on the hill from my grandma. The cows were beyond excited to travel to their exotic new land! They went nuts! But with new territory brings new illnesses the cows aren’t immune to. We noticed a few cows had drippy eyes and while those few were in the pen being examined, the rest of the herd was catching it. Pinkeye is also known as infectious bovine keratoconjunctivitis (IBK) and is one of the most common diseases of beef cattle. It is a highly contagious disease, causing inflammation of the cornea (the clear outer layer) and conjunctiva (the pink membrane lining the eyelids) of the eye. Being that it is very contagious the whole herd was at risk. Signs of pinkeye include wet, red, and irritated eyes. Often times the animal blinks or squints a lot and a small white spot will appear. How does it spread? Pinkeye begins with irritated eyes. Tall grasses and weeds, dust, sunlight and wind can irritate the cow. Once the cow is infected, the disease spreads through face flies. The bacteria can live in the fly for four days. How do you treat pinkeye? There are a couple options to treating pinkeye. The first is to spray pinkeye spray into the cow’s eye twice a day. This is not very efficient if the cows need to be on pasture to eat. Spraying the cow’s eye requires getting them into the chute. 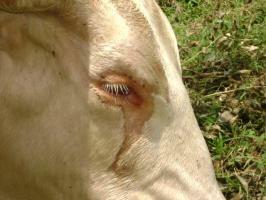 The second option is to give the cow a shot of Liquamycin at the first sign of pinkeye. The antibiotic instructions are below. We gave each cow a shot of LA-200 according to the correct dosage/weight. Most of our cows weigh 1000-1500 pounds so you can see below we gave between 45 and 54 cc. The label also says to discontinue treatment at least 28 days prior to slaughter. If and when we decide to sell a cow, we are required to wait 28 days before doing so. The meat packing plant will check for antibacterial residue when they are slaughtered. The third option is to give the cows a shot of penicillin in their eyelid. This might seem painful but it targets the bacteria at the site of infection. Occasionally pinkeye can get so severe that it can cause blindness or can even be fatal. The fourth option it to spray the eye and cover it up with an eye-patch. Light can cause irritation and by covering it up it excludes the UV and eliminates flies from bothering. We did the first and fourth option when we treated the cows two weeks ago but we were noticing the spread of pinkeye to other cows so this past weekend so we treated the diseased cows with treatments one-three. Pinkeye can be tricky to cure but hopefully we are finally ahead of it. Our main priority is the comfort and well-being of our livestock. Dad said this was the time of year grandma and grandpa would go on vacation… not this year… our cows want to keep us on our toes. And a good feeling it was! Here is the story of our beautiful, perfect, and completely appropriate proposal. Tyler asked me on Sunday if Zach and Rachel could join us for chores one night. I didn’t think anything of it because they had joined us earlier in the summer. On Monday night Tyler headed out to the farm to talk to Dad while I was at our Farm Bureau Annual Meeting. Tuesday was just a normal chore day or so I thought…as I was completely oblivious spraying the cows for flies. Tyler motioned over to Josie and suggested we spray her. I kind of blew it off and said I will in a minute. A second later he suggested it again so I was like fine lets head down there haha. To my surprise, Josie had something wrapped around her neck. I sped up to get a better look. I noticed the shape of the cow bell and assumed Dad was playing a prank on me. Josie is kind of an inside joke on our farm. She isn’t the most productive cow but she is the last cow from Grandpa’s herd and she holds a special place in our hearts. You can also tell from the photo that she is super wild! We got a little closer and I noticed writing on the front. I knelt down and read the words “Morgan Lee will you marry me?” I instantly got emotional! Tyler was on one knee by the time I turned around. I apparently was too shocked to stand back up after I read the cow bell because I am still on my knees in all of these photos haha. The whole moment was absolutely beautiful!! He put incredible thought into the proposal and having the cows involved meant so much to me. He knows me well!! A huge thanks to Zach and Rachel for capturing the moment. I am so happy to have photos to look back at. We couldn’t wait to tell all of our close family and friends but first we were treated to some ice cream!! We feel blessed to have so many wonderful people in our lives. Thank you to everyone who congratulated us on our proposal day! We are excited to announce that our wedding will be October, 2018. Bring on the love, happiness, excitement, and anticipation as we plan our fall wedding! I can’t wait to marry my best friend.